Cogs: Michele Olmstead and Eric Thompson spin out in The Adding Machine. THE MATH IS SIMPLE enough to do in your head: a good script plus a tight cast equals an impressive play. Sonoma County Repertory Theatre's splendid production of playwright Elmer Rice's The Adding Machine (directed by Jennifer King) definitely adds up. Meet Mr. Zero, a hapless cog spinning aimlessly amid the broad strokes of Rice's expressionistically drawn corporate world. Zero's career as an accountant at a behemoth firm has languished at the bottom rung for 20 years, his marriage is a charade, and his witless neighbors are pressed from the same middle-class mold as he. Originally staged in 1923, The Adding Machine is timeless testimony that, when unchecked, corporate culture can degrade the soul. Director King successfully underscores the imperishable core of Rice's work and presents an impressive cautionary tale that will speak to all those clamoring over the walls of their cubicles. Eric Thompson (a character actor par excellence) turns in an electric performance as Zero, a heartening and nimble motor-mouth who murders his overbearing employer (The Boss, robustly portrayed by Bill Harrison) with a bill spike when he is fired for requesting a raise. Thompson's Zero (duly punished and launched on a netherworld jaunt to salvation) is a hilariously endearing chump whose sad-sack antics speak of the spiritual costs incurred running the rat race. But despite his metaphysical infirmity, Zero manages to beam a dogged humanity. During a chilling comic sequence in the purgatorial quarters of a midlevel dispatcher of reincarnated souls (Harrison again), Zero discovers that he has been some order of slave in all his past lives. Having been subjugated by The Boss, pharaohs, and even primate alpha-males when in his original incarnation as a monkey, Zero is profoundly exasperated, and Thompson conveys this with unnerving credulity. Indeed, Thompson's acting is so persuasive, it's a marvel that talent scouts haven't shanghaied him to Broadway. Michele Olmstead plays Zero's irascibly adorable co-worker Daisy Diana Dorothea Devore, whose secret love for Zero is enough for her to gas herself at the prospect of finding the executed accountant in the afterlife. Olmstead, a fairly recent arrival to the Sonoma County stage (this is only her second show here), is an adept performer with keen comic ability. Her features contort elastically, her voice bounces in musical cadences, and, like Thompson, she can inspire empathy--upping the ante of Rice's dialogue from punchy to poignant while never losing a laugh. Also excellent is John Moran as Shrdlu, a matricidal denizen of the afterlife with an English brogue so thick that shoes could be made from it. Moran proves a superior comic talent as his Shrdlu gallivants throughout the Elysian Fields looking for retribution and being a preening nuisance to post-life paramours Zero and Daisy. Moran has a gift for infusing even the most banal utterance with comic verve and is truly a joy to watch. 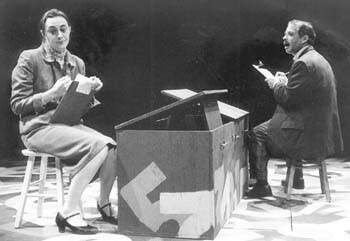 Kudos to set designer Michael Mingoia's economically inventive dressing of SCRT's studio space--a spare rectangular box serves as a coffin, a dinner table, and, when appended with a crank-handle, a monolithic adding machine. The stage floor is strewn with large, painted numbers, the detritus of Zero's crammed mind. Jerrie Patterson superbly costumes the cast in duds that look as if they were culled from The Cabinet of Dr. Caligari. Drab and colorless, the ill-cut suits and listless skirts deftly underscore the characters' psychic fatigue. White pancake makeup and heavy dollops of black exhume the players' cheekbones and hollow their eye sockets so that they look like the citizenry of an Edward Gorey cartoon. Though the cast may look like the well-coifed undead, SCRT's The Adding Machine teams with vitality and is equal to the cardinal number of 9 plus 1. The Adding Machine plays Thursday-Sunday through April 18. Thursday-Saturday at 8 p.m.; Sunday at 7 p.m. Sonoma County Repertory Theatre, 415 Humboldt St., Santa Rosa. Tickets are $12. 544-7278. From the April 9-15, 1998 issue of the Sonoma County Independent.